Most of us have had a brand new computer at one time. It’s a great feeling. You boot up windows and within 30 seconds you are surfing the net, checking your email, or playing your favorite game. 10 months down the road things aren’t so nice anymore. You power up your computer and it seems to take forever to load. Even when you are careful about what you install it seems that each day it takes longer for it to boot. It’s not your imagination – and there are a couple of good tips to keep your boot time short and sweet. The first tip I want to talk about is the windows prefetch. Windows XP has this feature that loads commonly used programs – at boot time. Here is how it works: Yesterday you used MS Word, and Duke Nukem 3D. Today you boot your system to check e-mail. It sees parts of these two programs in the prefetch folder and loads them into memory before windows completes the boot process. The benefit is faster application launch times. If you really wanted to use MS Word, it would pop up really quick when you double clicked on it. The problem is most people have been running windows for years, and the prefetch gets clogged with stuff that you almost never use. Windows takes forever to boot because it is prefetching a 1.0 copy of Napster, and you just want to check your email before you have to go to work. What can be done about it? Well there are a few things we can do to tweak the prefetch cache. One method is to disable it partially, and this can be done quite easily. The first thing to note is the next reboot will be slow. This is because windows needs to relearn the prefetch for system files. Subsequent boots will run much faster since the sludge of programs has been removed, and only new ones are in the cache. 0 – Disabled : The prefetch system is turned off. 1 – Application : The prefetch only caches applications. 2 – Boot : The prefetch only caches boot system files. 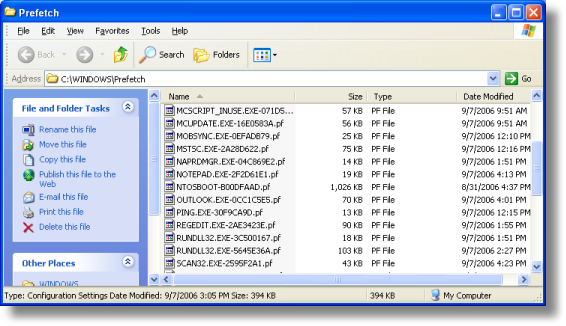 3 – All : The prefetch caches boot, and application files. We don’t want to disable it entirely. This would actually make boot times *longer*. This is because this feature is also used to speed up the loading of boot files. That is why we are going to pick the number 2 option. It allows us to keep the advantage of caching system files, without continually clogging the system up with applications. Set the value to 2 and reboot. The 2nd time you boot it should boot much faster. Remember that the side effect is that launching individual applications once windows has loaded will now be slightly slower. Over time your hard drive will become fragmented. An over simplified explanation of fragmentation is when your files and folders are not all stored in the same spot. For example lets say you had a large movie file. If it were fragmented the first 5 megabytes are at the beginning of the hard drive, and then next 5 are at the end. It takes longer for windows to read the file than it would if it were all in the same spot. The point is that if each file is stored in a linear fashion, and the drive does not have to move all over the place to read it – it will load faster. XP has a built-in defrag tool, and it is simple to run. 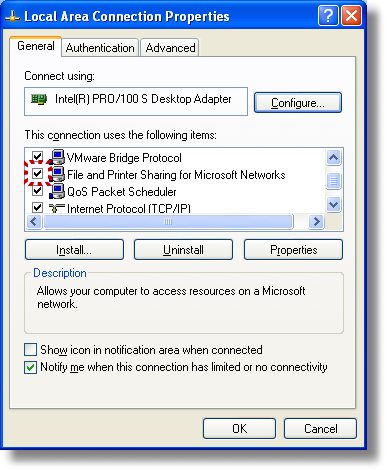 Open “My Computer” right click on the boot drive, and go to properties. Now click on the tools tab. Before you click on the “Defragment” button you want to close all applications and be aware that it might take hours to complete. If you leave something running it might keep windows from completing the defragment operation. Click on the drives you no longer need, and click OK.
One other item that can significantly impact is the “File and Printer Sharing” feature within windows. Obviously, if you are sharing your printer, or folders you don’t want to disable this – so this tip is not for you. If you never use it, then why waste your time waiting for it to load? That wraps up our windows startup optimization. And if you are tired of waiting for windows to shutdown, then check out our article on speeding that up too! Excellent. Very useful writeup. Thanks a lot. I tried the prefech changes you suggested and can’t for sure say if I’ve noticed a shorter boot time. Since that time I’ve also read a few other articles on the same subject and wanted to ask what your take was on them? http://www.edbott.com/weblog/?p=619 Your article does make perfect sense to clean out programs which are no longer installed or used. Do you still feel this is worthwhile? but i have to say this help section was great explaining but did not apply to me. i hope this comment helps others to boot quicker, keep an eye on what u install , lol. reduce the number of programs that appear on the desktop. My system starts up showing dummy icons on the desktop. Then sklowly finds the correct ones for each program. Anyway, there are a number of duplications between these two, which can ve elliminated. Having an empty Desktop removes the need of windows to access program-files you may rarely use. without any text and images!!! If I re-boot it – everything is fine. If your Pc is slow on fresh OS system check you hard drive setup, if you have Sata & IDE mixed your PC on start up will try IDE’s first and slow the PC down, anyway that’s what I found and that it took 4mins to boot even if I set the bios otherwise, I changed to all Sata hard drives and booted to welcome in 30secs. Nice work, this article really helped me out. This is really cool.Thanks a lot for your effective article. Wow, I am so happy I found this web page! I unchecked the printer share box, plus I turn off my printer at start up, and as of this morning I no longer want to throw my computer out the window. It was taking close to 20 mins to stop doing whatever it was doing to function without freezing, stalling and being down right frustrating. Works like it should now, swift and easy. I am very relieved! Thanks! Your Article is well written,and I really did appreciate it. However when I open “regedit” I only find the following entry that is close to what you say should be. I find (HKEY_LOCAL_MACHINE) and nothing else. I am running Win XP Media. Accross from this entry is another pane. It has a heading of NAME, TYPE, DATA. Under Name is: (Default). Under Type is; REG_SZ. Under Data: (value not set), and that’s all. So there is no way to select a vaule. I was able to delete the Prefetch folder info but like you said it’s just getting cluttered up again. Can you tell me what else to do to prevent the build up again. Thank you. Very comprehensive – thank you for posting! What should I do if My computer is on the Active Directory domain? 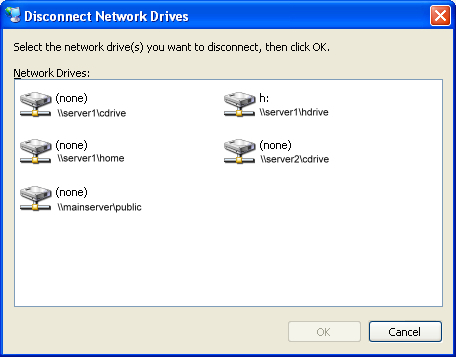 I can’t disconnect network drives and disable File and Printer Sharing. Actually you can, as long as your computer is not sharing files, you will still be able to connect to other machines with it enabled. YE GODS! This is BRILLIANT… . Computer used to get so far on the black screen then sit accessing the hard drive for a long time without moving the progress bar before (finally) logging on. I know you said it would take a long time the first time you rebooted… But just clearing the prefetch directory and resetting the prefetch key reduced the boot time (first time) from several minutes to about 50 seconds…. and it’s down to 20 seconds on subsequent reboots! WELL DONE! Last time I had this problem with Windows XP. And my computer never recovered after that rebooting. But it was old and slow and I was already planing to buy a new one, so I just bought one. It worked! It solved my slow start-up time. Forever gratefull. Why would my pc only be slow in the morning? Probably because your virus scan is set to scan all drives in the morning. That would be my guess. Why can’t I find this on my computer? I run windows xp and have had tons of issues mostly that when I click on any of the icons on my home page of my computer it takes forever for anything to open up. As well when I go to install a download it takes a very long time no matter the size of the download??? When I start my computer, LAN icon takes long time to load as a result window hangs for a while & as soon as LAN icon appears then speed of window come to normal, please advise me what to do, i will be very thankful to all of you. your steps didn’t worked for me. I don’t know why,the points you highlighted are reasonable but still not working. 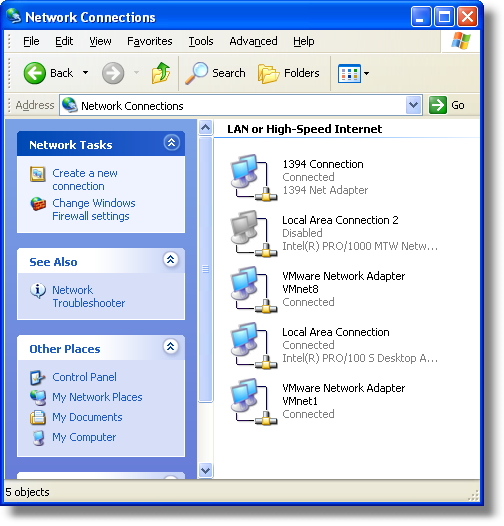 One thing to check – are you on a network (LAN). 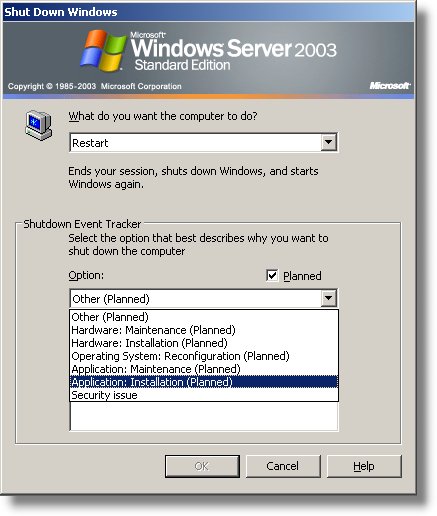 And if so, do you have anything on your desktop that is pointing to a network resource (Server/Workstation) that no longer exists? it takes forever for my pc to come on and even more forever for emails to load.i just got my laptop at christmas. its a windows 7 so i know its not old. i need a BOOK for dummies to help me. i cant follow your instructions. Your computer us slow due to how the files are layed out on your hard drive, not necessarily if its fragmented or not. After a few updates your files will be placed randomly acroos your drive and the seek time required to access those file will increase and thus slow down your computer considerably. Replace your Hard drive with an SSD and you will see a huge increase in performance. SSD’s do not have a performance hit on how files are positioned. Is there any other reason for slow down windows startups than prefetch folder. Is Microsoft Security Essentials really protects my windows, because one i have? It was really useful as it worked for me and thanks alot for those ho posted this. Thanks very much,the prefetch hint has solved a lot of my boot time problems. does this also work on windows 7? or only xp? Thanks a lot, I was about to throw away my old XP-laptop, which took forever to be useable after turning on. Cleaning the prefetch folder etc. has worked miracles for the boot time, so I think I´ll keep it!! Works on win 7 too. my system booting time take 2min and set-down after CPU power don’t disconnect why? Ive got it working again .. Finally !! Clearing out prefetch and setting enableprefetcher to 2 worked like a dream. My ‘puter is so much faster at startup it’s like a new machine! I had to readup about regedit elsewhere before I understood what to do though. Many thanks. how to do the same for windows 7?